A brand new vegan bloggers joins the VBU! family. Please meet Robyn B, the author of Modern Day Missus lives in Perth, Australia. Robyn lives with her two naughty cats, an equally naughty husband, a juicer and a blender. She is a herbal tea lover, aspiring health goddess and cookbook addict, who loves all things life and living…. She also has a knack for accidentally burning pine nuts. Her blog Modern Day Missus is a place of community, laughs, positivity and bundles of vegan recipes. Check out Modern Day Missus and follow her on her social media channels: Blog, Facebook and Instagram. Welcome Robyn! How is your week going? Yay for public holidays – I’ve only been at work for one day, and there are only two to go this week… not that I don’t like my job… but if I won lotto, I think I could definitely rock the lady of leisure gig. On the weekend just gone, I got cracking in the kitchen and made heaps of recipes (there is one recipe however that still eludes me, but I have a plan… stay tuned!) that I’ve had on my mind. Thinking of recipes is one thing, but having the time to try them out, make sure they’re right and photograph them is not that easy. When I look back, even at recipes from a year ago, I’m so embarrassed at the quality of the photos. A lot of that is because I was taking them at night once I’d cooked them for dinner. But, if I have learnt one thing about photographing food (or anything really), it’s that you can’t substitute natural light. Anyhoo, of all the things I made, the vote came out (from my sister) for these, Potato and Pea Cigars. 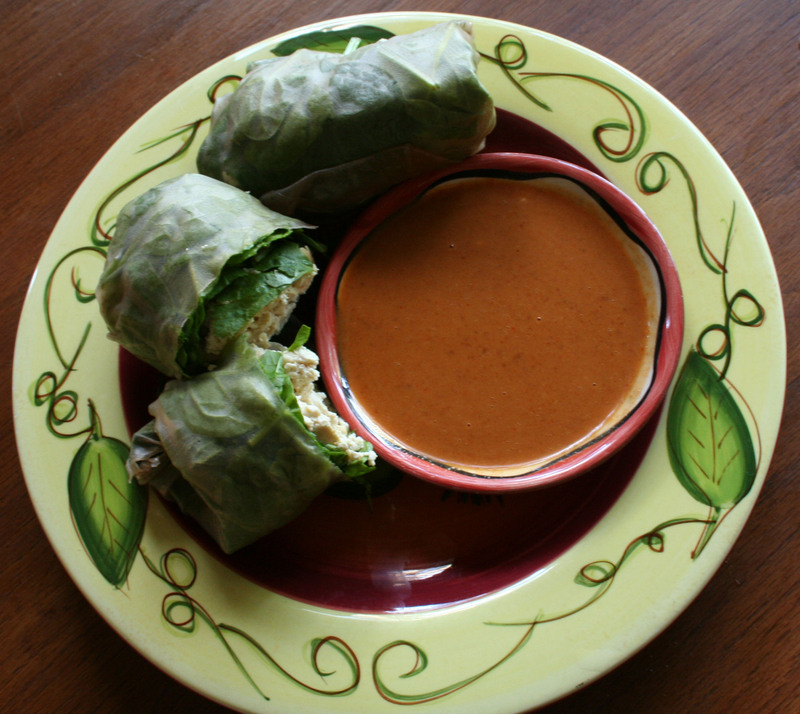 Think light Indian flavour, but wrapped like a spring roll. 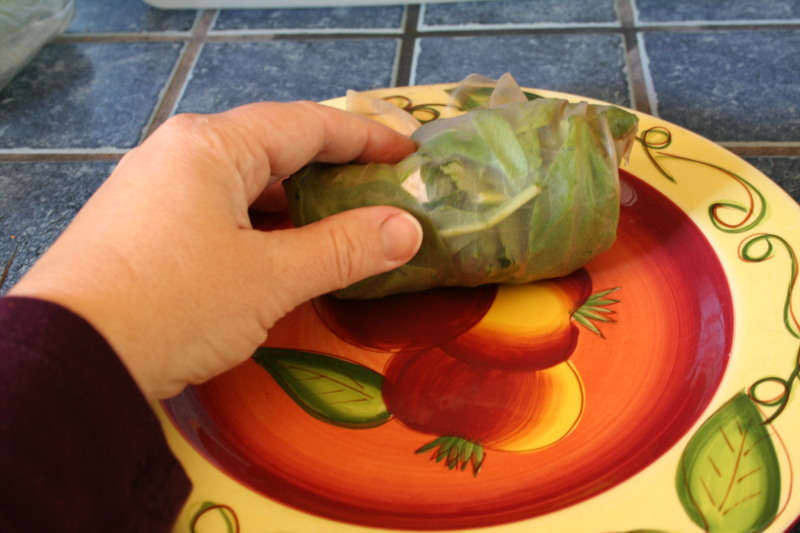 Spring rolls are easier to eat (you don’t get bits fall out all over the place, and they’re easier to wrap when you’re working with small spring roll wrappers). These would make an awesome party food, and once you’ve wrapped one or two, you get the knack and can put them together really quickly. Peel the potatoes and chop into small cubes (think of the size you want to put them into the spring rolls), and then par boil for about 12-15 minutes or until pretty much cooked. Drain and set aside for a few moments. Preheat the oven to about 200∞C (about 400∞F). Put a dash of olive oil in a frypan, and fry the spices for about 20 seconds or until they are lovely and aromatic. Add the frozen peas and coat in the spice mix. Then, add the potatoes and do the same. Fry for about 3 minutes all up, or until the peas are not yet frozen (they don’t need to be fully cooked, as they go into the oven after this). 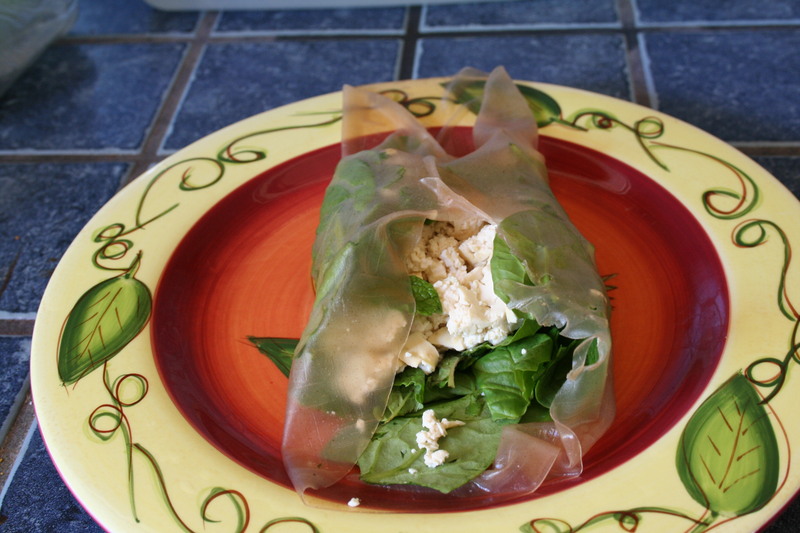 Once your mixture is done, get a sheet of spring roll wrapper and place in front of you on an angle (so a corner is facing you, like a diamond). 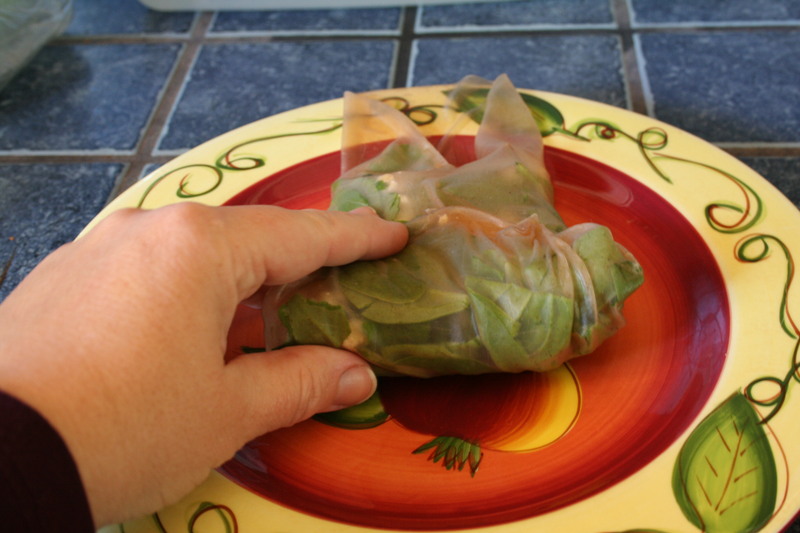 Then place in some filling, fold up the two side edges, and then wrap. When you come to the last corner (which should be the furthest corner from you), dip your fingers in water and dab on the corner so it all sticks together. Once you’ve done all your spring rolls, put them in a very lightly greased oven tray and bake for about 15 minutes. Makes about 15 spring rolls. [br]You probably won’t use all of the spring roll wrappers with this quantity, but (if you didn’t buy them frozen), you can then freeze the remainder. The great thing about these spring rolls is that they’re not heavy and greasy because they’ve been oven baked and not deep fried. They don’t have too strong an Indian flavour, but you could increase the spices if you want more.